Horseshoe Bend in Glen Canyon National Park, Arizona, USA. A spectacular rock formation situated in Glen Canyon National Park in Arizona, USA. Just 100 kilometres north-east of the United States’ most famous canyon is the underrated Glen Canyon National Park. This not-so-little gem is spread over 485,000 hectares, stretching from Lees Ferry in Arizona to the Orange Cliffs of southern Utah. The park is popular with American holiday-makers who head in droves to its famous Lake Powell – a vast blue reservoir in the Colorado River, which is abuzz with all sorts of aquatic activities from waterskiing to house-boating to kayaking. 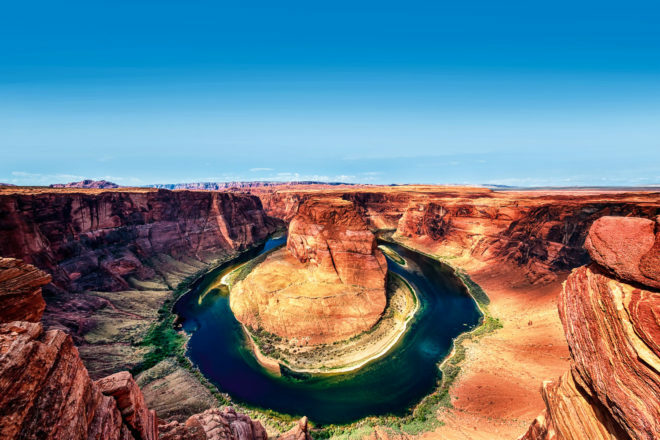 But just 16 kilometres south is the real highlight: this spectacular curve in the Colorado River, aptly named Horseshoe Bend and described as ‘the intimate Grand Canyon’. Located at Arizona’s northern border, this work of nature was created around five million years ago when the Colorado Plateau rose, trapping the rivers that curved across the landscape. Over time these rivers cut through the sandstone deep and fast creating this unique 270-degree bend. A hike to the rim is around 2.4 kilometres up and down sandy hills and a gentle sandstone incline, but it’s well worth the effort for this breathtaking view. The colours change throughout the day – from vivid to moody and everything in between – making this one hell of a photogenic natural wonder. Just point and shoot!